Two years ago, we set out on an amazing adventure resulting in stamps from 20 new countries in our passports and a lifetime of memories. On March 23, our time in Japan came to an end. Looking back, it’s hard to summarize the experience. From the first days, sorting out internet service while getting to know our new neighborhood (post #1 on Cascadian Abroad! ), to the last days as seasoned travelers making our way around Europe, we’ve seen things we never thought we’d see and met people we’d never have met in the U.S. Upon returning from Europe, we had just two weeks left in Japan. Most of that time was spent packing bags and cleaning out our apartment. Fortunately, we were also able to touch base with some of our new friends we’d be leaving behind. 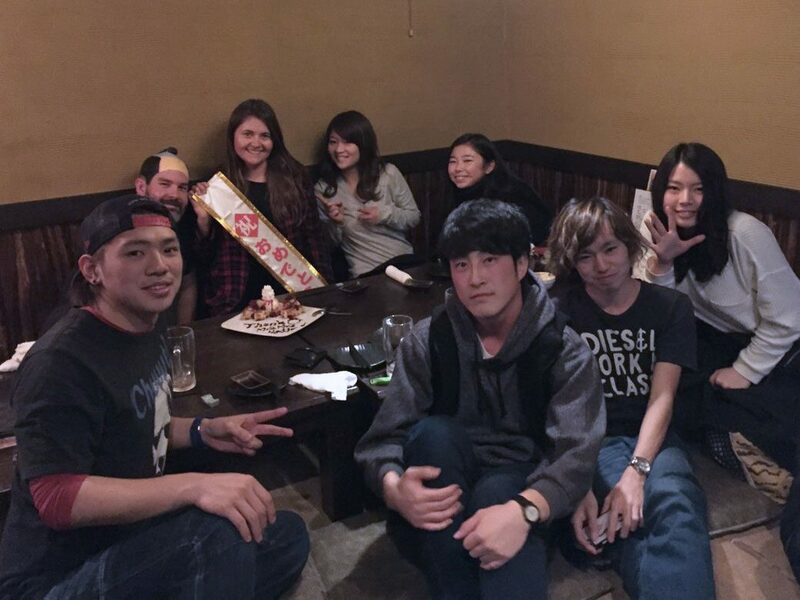 We met up with some of the students from the first year for dinner at a local izakaya and karaoke. 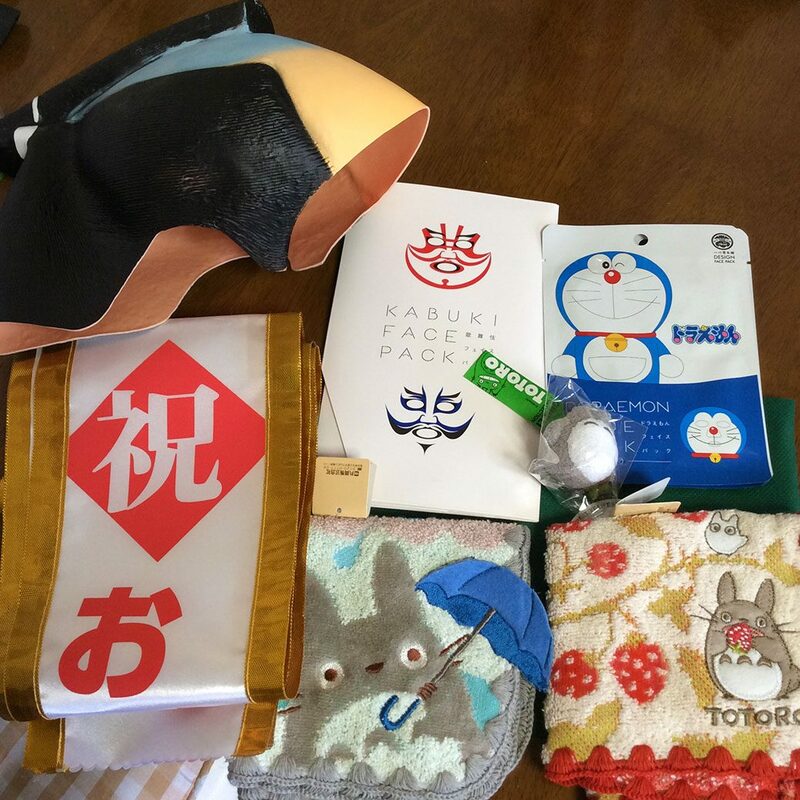 They presented us with several gifts, including a rubber samurai wig for me. One of the students worked at the izakaya and organized several vegetarian options for us. At karaoke, we sang mostly American pop songs, but at the end of the night, they sang a Japanese song called Sangatsu Kokonoka (March 9 in English, video below) and each of them took a turn singing a verse. It was sweet and touching. The night before we left, our former neighbor Tomoko and her two girls showed up at our door with some going away gifts and an awesome drawing of us by her four-year-old. 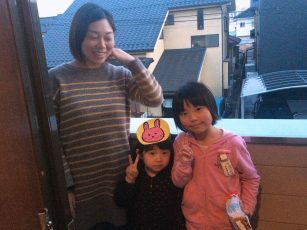 She and her family included us in hanami (cherry blossom picnic) and Kawagoe Festival last year and we’ll miss their kindness and generosity. At the izakaya with last year’s Section 5 crew. 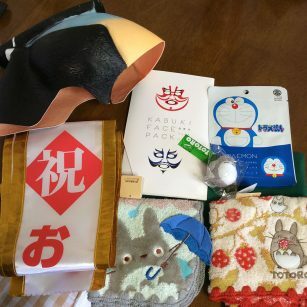 The haul of gifts from the Section 5 kids. 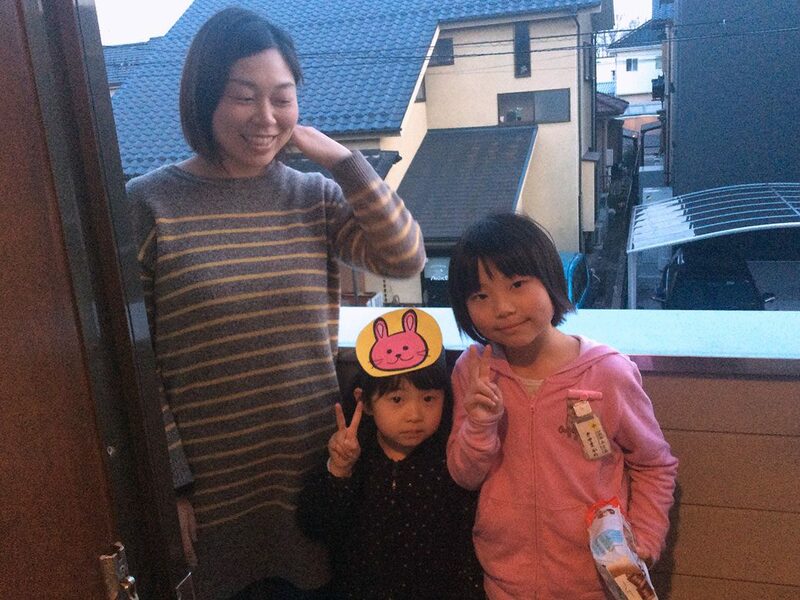 Tomoko and her daughters at our apartment the night before we left. Reunited in the PDX parking garage! The next day, we said goodbye to Mrs. Nakano. When we moved into our apartment, she was one of the first to greet us, offering some furniture for our new home. Over the last two years, she’s kept an eye out for us, offering vegetables from her garden and stopping to talk with us whenever we’d pass by. She made our transition a lot easier simply by accepting us. That afternoon, we finished checking out of our apartment. Two of the students from karaoke night drove over to take us to the bus station. We were loading our luggage into the car when another neighbor, Serika, and her son came around the corner. He had a look of shock on his face when he saw our bags going into the car. I’d left a note in their mailbox, but quickly jogged over to say goodbye in person. The boy is learning a little bit of English at school, so he always says “Hello” instead of “Konnichiwa” when he sees us. Last summer, they invited us to do fireworks with them out in front of the house. We’ll miss their smiling faces. When you introduce yourself to someone in Japanese, you say douzo yoroshiku onegai shimasu, which literally means please be kind to me. We couldn’t have asked for kinder friends and I hope we’ll have the opportunity to cross paths again in the future. After a nine-hour red-eye flight from Tokyo to Los Angeles, a five-hour layover with increased security thanks to the events in Brussels and another flight from LA to Portland, it was good to be back on solid ground. 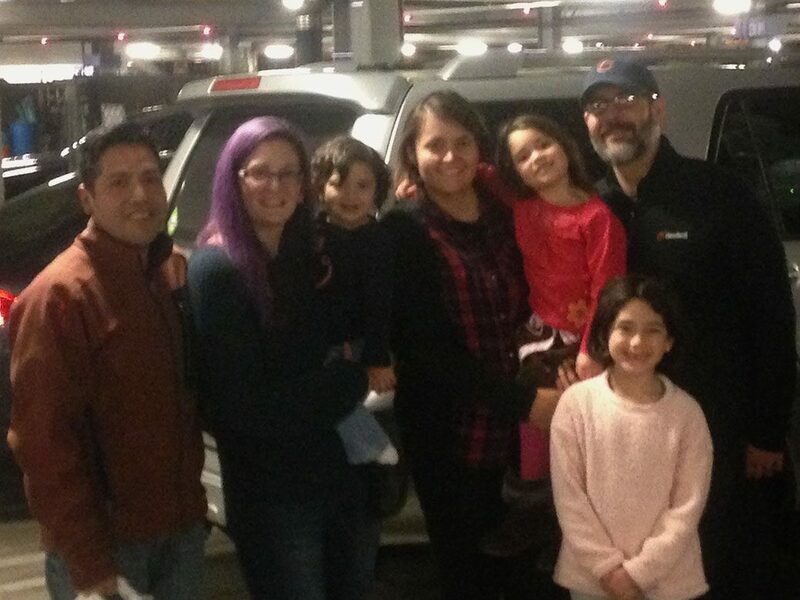 Our friends surprised us in the terminal with their three girls (who grew so much over the last two years!) and they brought our car, which they’d taken great care of while we were away. Driving for the first time in two years was strange, especially at night and in the rain after just a few fitful hours of airplane sleep. Our first stop was for Mexican food—it’d been a LONG time!—then onto my brother’s house, where my mom surprised us as well. We didn’t last too long before the bed called our names, but it was great to see everyone. As we figure out our next steps, we’ll continue posting here at Cascadian Abroad. We still have lots of travel stories to tell and certainly won’t stop traveling now! While we get settled, I hope you’ll check out some of the older posts and say hello in the comments section below! Amazing adventure indeed! Really hard to believe it’s been two years already. I’ve really enjoyed reading about your travels Robert. I can’t believe how much time you spent on the road (or in the air) during those two years. Look forward to hearing about your future plans! Thanks Brian! Already thinking about possible destinations for the next adventure. Always sad to leave new and special friends,but I’m glad you and Viktoria are back. Can’t wait to hug you. Welcome home! It hardly seems possible 2 years have gone by. What an amazing adventure indeed! It is incredible to believe it has been two years already!! i was thinking you would be home soon. I am so glad you both had this opportunity. The girls are well, they can stay as long as needed until you guys are settled and decide you are ready to have them back… or …..as long as you want to leave them 🙂 They are welcome! Dora oddly enough never misses the chance to lay down with me when I am sitting or laying on the couch. It seems odd; not sure if she is cold all the time or what the change has been; makes Astro upset she doesn’t get her share of “lap” time! Glad you both are home safe and sound!